Iowa State running back David Montgomery, who became the eighth player in school history with multiple 1,000-yard rushing seasons this fall, decided today he will enter his name for the 2019 NFL Draft and forgo his final season of eligibility at Iowa State. Montgomery announced his decision on Twitter this morning. 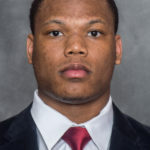 A native of Cincinnati, Ohio, Montgomery was a key part of Iowa State’s resurgence on the gridiron the past two seasons, helping the Cyclones to back-to-back 8-5 marks with his dependability and durability in the backfield. The two-time first-team All-Big 12 selection ranked third in the Big 12 and 23rd nationally in rushing, averaging 101.3 rushing yards in 12 games in 2018. He reached the 100-yard mark seven times during the season, tying for third on ISU’s season list, and led the team with 13 touchdowns.